In the Treaty of Paris (1783), which formally ended the American Revolutionary War, Great Britain yielded this region to the United States. However, the Confederation Congress faced numerous problems gaining control of the land; these included: the unsanctioned movement of American settlers into the Ohio Valley, violent confrontations with the region's indigenous peoples, and an empty U.S. treasury. The ordinance superseded the Land Ordinance of 1784 (which declared that states would one day be formed within the region) and the Land Ordinance of 1785 (which described how the Confederation Congress would sell the land to private citizens). Designed to serve as a blueprint for the development and settlement of the region, what the 1787 ordinance lacked was a strong central government to implement it. This need was addressed shortly thereafter, when the new federal government came into existence in 1789. The 1st United States Congress reaffirmed the 1787 ordinance, and, with slight modifications, renewed it through the Northwest Ordinance of 1789. Considered one of the most important legislative acts of the Confederation Congress, it established the precedent by which the Federal government would be sovereign and expand westward with the admission of new states, rather than with the expansion of existing states and their established sovereignty under the Articles of Confederation. It also set legislative precedent with regard to American public domain lands. The U.S. Supreme Court recognized the authority of the Northwest Ordinance of 1789 within the applicable Northwest Territory as constitutional in Strader v. Graham, but did not extend the Ordinance to cover the respective states once they were admitted to the Union. The territory was acquired by Great Britain from France following victory in the Seven Years' War and the 1763 Treaty of Paris. Great Britain took over the Ohio Country, as its eastern portion was known, but a few months later closed it to new European settlement by the Royal Proclamation of 1763. The Crown tried to restrict settlement of the thirteen colonies between the Appalachians and the Atlantic, which raised colonial tensions among those who wanted to move west. With the colonials' victory in the American Revolutionary War and signing of the 1783 Treaty of Paris, the United States claimed the territory, as well as the areas south of the Ohio. The territories were subject to overlapping and conflicting claims of the states of Massachusetts, Connecticut, New York, and Virginia dating from their colonial past. The British were active in some of the border area until after the Louisiana Purchase and the War of 1812. The region had long been desired for expansion by colonists. The states were encouraged to settle their claims by the US government's de facto opening of the area to settlement following the defeat of Great Britain. In 1784, Thomas Jefferson, a delegate from Virginia, proposed that the states should relinquish their particular claims to all the territory west of the Appalachians, and the area should be divided into new states of the Union. Jefferson's proposal to create a federal domain through state cessions of western lands was derived from earlier proposals dating back to 1776 and debates about the Articles of Confederation. Jefferson proposed creating ten roughly rectangular states from the territory, and suggested names for the new states: Cherronesus, Sylvania, Assenisipia, Illinoia, Metropotamia, Polypotamia, Pelisipia, Washington, Michigania and Saratoga. The Congress of the Confederation modified the proposal, passing it as the Land Ordinance of 1784. This ordinance established the example that would become the basis for the Northwest Ordinance three years later. The Northwest Ordinance of 1787 established the concept of fee simple ownership, by which ownership was in perpetuity with unlimited power to sell or give it away. This was called the "first guarantee of freedom of contract in the United States". Passage of the ordinance, which ceded all unsettled lands to the federal government and established the public domain, followed the relinquishing of all such claims over the territory by the states. These territories were to be administered directly by Congress, with the intent of their eventual admission as newly created states. The legislation was revolutionary in that it established the precedent for new lands to be administered by the central government, albeit temporarily, rather than under the jurisdiction of the individually sovereign original states, as it was with the Articles of Confederation. The legislation also broke colonial precedent by defining future use of the natural navigation, transportation and communication routes; it did so in a way that anticipated future acquisitions beyond the Northwest Territories, and established federal policy. Article 4 states: "The navigable waters leading into the Mississippi and St. Lawrence, and the carrying places between the same, shall be common highways and forever free, as well to the inhabitants of the said territory as to the citizens of the United States, and those of any other States that may be admitted into the confederacy, without any tax, impost, or duty therefor." The most significant intended purpose of this legislation was its mandate for the creation of new states from the region. It provided that at least three but not more than five states would be established in the territory, and that once such a state achieved a population of 60,000 it would be admitted into representation in the Continental Congress on an equal footing with the original thirteen states. 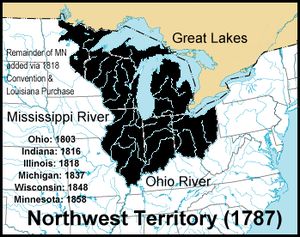 The first state created from the Northwest Territory was Ohio, in 1803, at which time the remainder was renamed Indiana Territory. The other four states were Indiana, Illinois, Michigan, and Wisconsin. A portion (about a third) of what later became the state of Minnesota was also part of the territory. The ordinance of Congress called for a public university as part of the settlement and eventual statehood of the Northwest Territory, further stipulating, "Religion, morality and knowledge being necessary to good government and the happiness of mankind, schools and the means of education shall forever be encouraged." In 1786, Manasseh Cutler became interested in the settlement of western lands by American pioneers to the Northwest Territory. The following year, as agent of the Ohio Company of Associates that he had been involved in creating, he organized a contract with Congress whereby his associates (former soldiers of the Revolutionary War) might purchase 1,500,000 acres (610,000 ha) of land at the mouth of the Muskingum River with their Certificate of Indebtedness. Cutler also took a leading part in drafting the Ordinance of 1787 for the government of the Northwest Territory, which was finally presented to Congress by Massachusetts delegate Nathan Dane. To smooth passage of the Northwest Ordinance, Cutler bribed key congressmen by making them partners in his land company. By changing the office of provisional governor from an elected to an appointed position, Cutler was able to offer the position to the president of Congress, Arthur St. Clair. In 1797, settlers from Marietta traveled upstream via the Hocking River to establish a location for the school, choosing Athens due to its location directly between Chillicothe and Marietta. Originally named in 1802 as the American Western University, the school never opened. Instead, Ohio University was formally established on February 18, 1804, when its charter was approved by the Ohio General Assembly. Its establishment came 11 months after Ohio was admitted to the Union. The first three students enrolled in 1809. Ohio University graduated two students with bachelor's degrees in 1815. While the population of free, male inhabitants of a territory was less than 5,000, there would be a limited form of government: a governor, a secretary, and three judges, all appointed by Congress. The governor—appointed for a three-year term and given a "freehold estate therein, in one thousand acres of land"—would be commander-in-chief of the militia, appoint magistrates and other civil officers, and help create and publish laws as they saw fit for their territory. The secretary—appointed for a four-year term and given a similar freehold estate as the governor but of five hundred acres—would be in charge of keeping and preserving the acts and laws passed by the territorial legislatures, keeping the public records of the district, and transmitting authentic copies of such acts and proceedings every six months to the secretary of the Continental Congress. Three judges—whose appointments would continue indefinitely "during good behaviour" and each given the same freehold as the secretary—would be in charge of helping the governor create and pass acts and laws and in making official court rulings. Once the population of a territory reached 5,000 free, male inhabitants, then they would receive authority to elect representatives from their counties or townships to a territorial general assembly. For every 500 free males there would be one representative, until there were 25 representatives. Then the Congress would control the number and proportion of the representatives from that legislature. No male could be a representative unless they were a citizen of the United States for at least three years or lived in the district for three years and who did not own at least 200 acres of land within the same district. These representatives would serve for a term of two years. If a representative died or was removed from office, a new one would be elected to serve out the remaining time. The language of the ordinance prohibits slavery, but also contained a clear fugitive slave clause as well. Efforts in the 1820s by pro-slavery forces to legalize slavery in two of the states created from the Northwest Territory failed, but an "indentured servant" law allowed some slaveholders to bring slaves under that status; they could not be bought or sold. Southern states voted for the law because they did not want to compete with the territory over tobacco as a commodity crop; it was so labor-intensive that it was grown profitably only with slave labor. Additionally, slave states' political power would merely be equalized, as there were three more slave states than there were free states in 1790. Article III. Religion, morality, and knowledge, being necessary to good government and the happiness of mankind, schools and the means of education shall forever be encouraged. The utmost good faith shall always be observed towards the Indians; their lands and property shall never be taken from them without their consent; and, in their property, rights, and liberty, they shall never be invaded or disturbed, unless in just and lawful wars authorized by Congress; but laws founded in justice and humanity, shall from time to time be made for preventing wrongs being done to them, and for preserving peace and friendship with them. Many Native Americans in Ohio, who were not parties, refused to acknowledge treaties signed after the Revolutionary War that ceded lands north of the Ohio River inhabited by them to the United States. In a conflict sometimes known as the Northwest Indian War, Blue Jacket of the Shawnees and Little Turtle of the Miamis formed a confederation to stop white expropriation of the territory. After the Indian confederation had killed more than 800 soldiers in two battles – the worst defeats ever suffered by the U.S. at the hands of the Indians – President Washington assigned General Anthony Wayne command of a new army, which eventually defeated the confederation and thus allowed European-Americans to continue settling the territory. In 1907, a plaque commemorating the "first permanent settlement in the territory northwest of the Ohio" and the Northwest Ordinance was placed on the exterior of the Federal Hall National Memorial at the corner of Broad and Nassau Streets in Lower Manhattan. Federal Hall served as the nation's seat of government in 1787, when the Northwest Ordinance was passed into law. On July 13, 1937, the U.S. Post Office issued a 3-cent commemorative stamp to mark the 150th anniversary of the Northwest Territory as defined by the Ordinance of 1787. The engraving on the stamp depicts a map of the United States at the time between the figures of Manasseh Cutler (left) and Rufus Putnam (right). ^ "Land Ordinance of 1785". Ohio History Central. Retrieved December 16, 2018. ^ Horsman, Reginald (Autumn 1989). "The Northwest Ordinance and the Shaping of an Expanding Republic". The Wisconsin Magazine of History. 73 (1): 21–32. JSTOR 4636235. ^ "Northwest Ordinance". loc.gov. Library of Congress. ^ Strader v. Graham, 51 U.S. (10 How.) 82, 96-97 (1851). ^ a b Hubbard, Bill, Jr. (2009). American Boundaries: the Nation, the States, the Rectangular Survey. University of Chicago Press. pp. 46–47, 114. ISBN 978-0-226-35591-7. ^ "Report from the Committee for the Western Territory to the United States Congress". Envisaging the West: Thomas Jefferson and the Roots of Lewis and Clark. University of Nebraska–Lincoln and University of Virginia. March 1, 1784. Retrieved August 19, 2013. ^ De Soto, Hernando (2000). The Mystery of Capital: Why Capitalism Triumphs in the West and Fails Everywhere Else. Basic Books. ISBN 978-0465016143. ^ McDougall, Walter A. Freedom Just Around the Corner: A New American History, 1585–1828. (New York: Harper Collins, 2004), p. 289. ^ "Northwest Ordinance". Primary Documents in American History. Library of Congress. July 13, 1787. pp. 335–337. Retrieved March 7, 2019. ^ "Northwest Ordinance". Primary Documents in American History. Library of Congress. July 13, 1787. pp. 337–338. Retrieved March 7, 2019. ^ Transcript of the Northwest Ordinance – 1787. An Ordinance for the government of the Territory of the United States northwest of the River Ohio. Section 8. Retrieved March 21, 2014. ^ Trotter, Gordon T. (November 27, 2007). "Ordinance of 1787 Sesquicentennial Issue". arago.si.edu. Washington, D.C.: Smithsonian National Postal Museum. Retrieved December 16, 2018. Berkhofer Jr, Robert F. "The Northwest Ordinance and the Principle of Territorial Evolution." in The American Territorial System (Athens, Ohio, 1973) pp: 45-55.